This live webinar will showcase how Qualys and Kenna together connect an organization’s vulnerability scanning program with actionable threat intelligence to employ a risk-based approach to vulnerability management. Learn how companies are driving down their exposure to vulnerabilities that match active Internet breaches, and track remediation progress with little manual effort and without adding additional headcount. 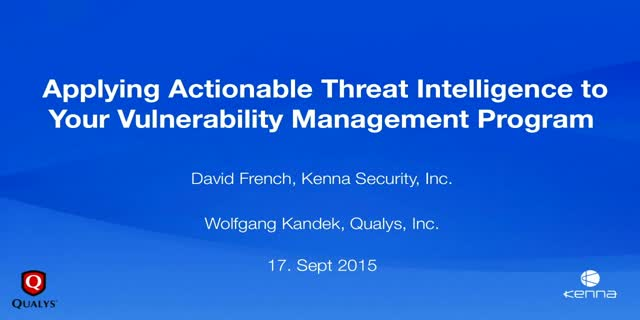 Wolfgang Kandek, CTO, Qualys and David French, VP of Sales & Business Development, Kenna Security, Inc. Presented by: Wolfgang Kandek, CTO, Qualys and David French, VP of Sales & Business Development, Kenna Security, Inc.